So, something I read the other day got me thinking. What brings happiness in a person's life? What brings despair? Is a person with a disability doomed to despair? A "normal" person guaranteed happiness? Life isn't filled with guarantees. Just because a person is born healthy, doesn't guarantee happiness any more than a person that is born with challenges are doomed to struggles and unhappiness. Life is what you make of it. Sure, a person with a disability may face struggles and hardships that a typical person may not. Does that mean they will be unhappy? Presented with the argument "I know someone with a disability that had a horrible life, so ALL people with that disability will have that same horrible life", one must sit back and think. Do all typical people have wonderful lives because they aren't faced with the challenges of that disability? 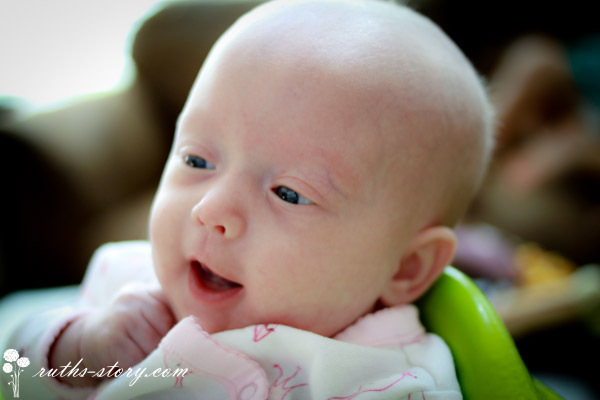 When Ruth was diagnosed last May at our 20 week sonogram, I was heartbroken. Presented with the fact that the child you love so much, one you haven't even met yet, will face challenges. But since then, I have moved past that sadness, to extreme happiness and love, and I would not change a thing about my sweet little baby. She has brought so much love to our lives, already. Her sweet little baby cuddles and coos. The people she has brought to our lives, from the people we met at the Family House and in the UCSF Hospital in San Francisco, to the other wonderful parents I have met online in the SB support group. Watching her achieve goals, such as just learning to eat, that one might take for granted in typical kids, has brought us such joy. I know as she grows, everything she accomplishes will bring us more and more joy. In just the few months of her life, she has touched so many hearts already. This world would be worse off already, had she not been born. So, expecting mother's out there, if you are faced with the news no parent wants to hear, don't despair. There is joy and happiness for your child in this world, and for you, ten fold, for bringing that child life. All you have to do is embrace it. Everyone faces their own challenges and being someone who was not born with spina bifida doesn't mean you won't face your own challenges! I COMPLETELY agree with you are responsible for your own life and what you make of it! And PS Your Ruth is so cute!